= Sempervivum arachnoideum f. cristatum hort. Accepted Scientific Name: Sempervivum arachnoideum L.
Sp. Pl. 465 1753. [1 May 1753] L.
Origin and Habitat: Garden origin (Nursery produced cultivar). The original natural habitat of this species are the ountain of Europe from the Pyrenees to the Carpathians where many variations occur naturally. 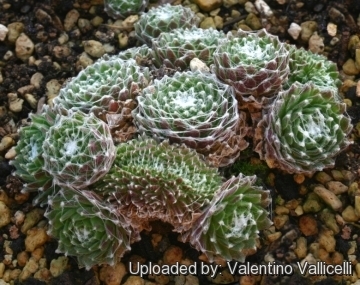 Description: Sempervivum arachnoideum is a small, evergreen perennial succulent that grow in very tight rosette forming mats up to 30cm (or more) in diameter, often cultivated in rock gardens. It is a very variable species. 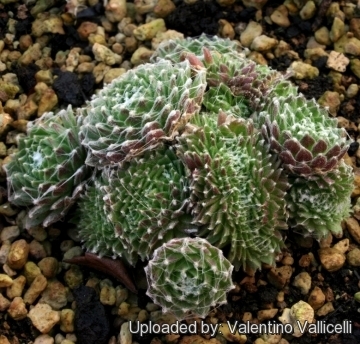 Crested form Sempervivum arachnoideum f. cristatum is a curiosity that is fasciated (crested). The fasciation is not very stable and most of the rosettes are normal. Rosettes: Each rosette is small. Some of the rosettes are fasciated (crested) while for the most part they are ball shaped and may have up to 50-60 leaves. The tips of the leaves are connected together by a very fine webbing that looks just like cobwebs thin, but there are many different clones. Some are very furry other slightly furry, there are also types that are red, some maroon, others green. Crested growth: Unlike 'monstrose' varieties of plants, where the variation from normal growth is due to genetic mutation, crested growth can occur on normal plants. Sometimes it's due to variances in light intensity, or damage, but generally the causes are unknown. 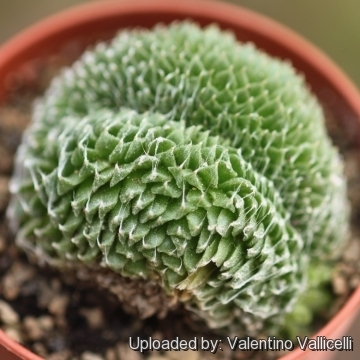 A crested plant may have some areas growing normally, and a cresting plant that looks like a brain, may revert to normal growth for no apparent reason. Any normal shoots should be removed to promote the growth of the crest. 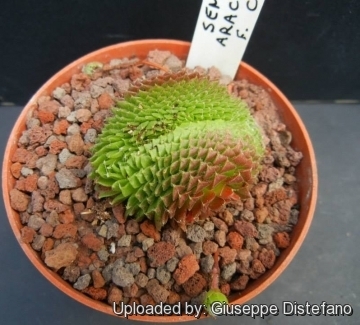 Curiosity: In Europe, the sempervivums (A.k.a. 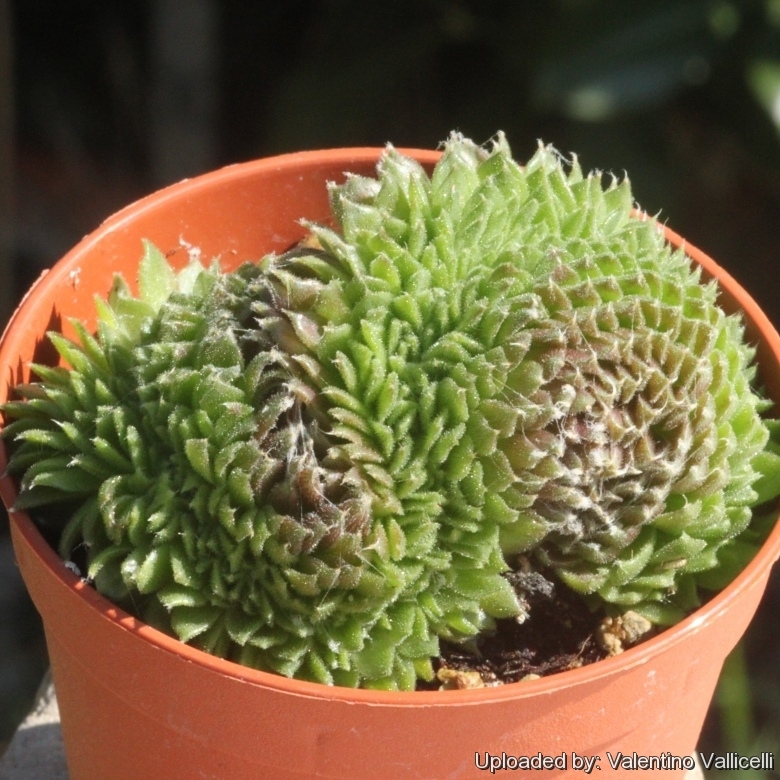 Houseleek or Hens & Chicks) are sometimes used in roofing, with the plants grown in between roofing tiles; they are believed to ward off lightening.